Small pottery owl with carved feathers and polychrome decorations. Raised and black eyes; the rest is matte. He maybe irresistibly cute, but this little owl is a fine piece of handmade pottery, from the gathering of the clays needed to mixing, coiling, smoothing, carving, polishing with a stone, painting, pit-firing. Owls are considered protectors, sort of animated alarm systems, by the Pueblo people. Additionally, they are honored because they eat vermin that might destroy crops. So cute he may be, but there is a lot more to this handsome little guy than just looks. Although he looks very fetching…. I received the little owls and the butterflies today and am very pleased. 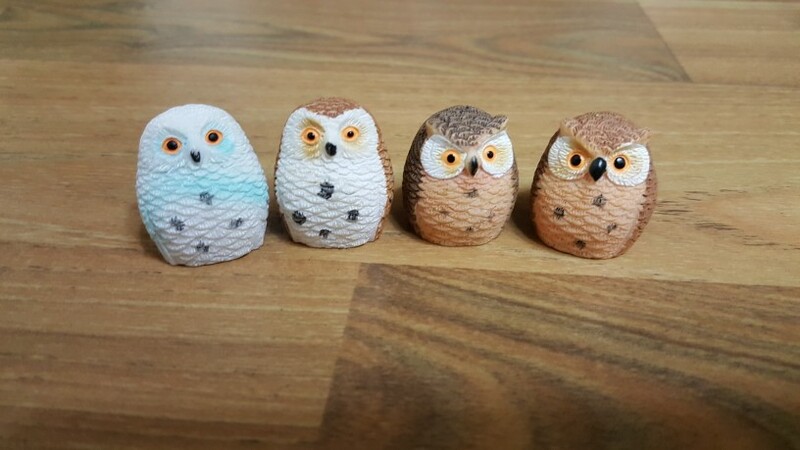 The owls are adorable and can’t wait to put them out or make something with them. Emily Lu has been a great communicator and was letting me know when it was shipped and when I would get it. She is a great seller and I highly recommend her and her business. Thank you, Emily Lu! !